A woman in Manhattan got stuck in an elevator Friday evening – and wasn't rescued until Monday morning. According to HuffPost, the unidentified woman was cleaning a five-story townhouse in the Upper East Side of Manhattan when she became trapped in the elevator between the 2nd and 3rd floor. The homeowners were out of town for the entire weekend, the elevator didn't have a phone, and apparently she didn't have a cell phone on her. Finally, on Monday morning, one of the homeowners came home, realized what had happened and called 911. Firefighters broke into the elevator around 10am, rescued the woman, and sent her to the hospital. Miraculously, she's in good condition. Moral of the story for claustrophobic people like me: take the stairs. 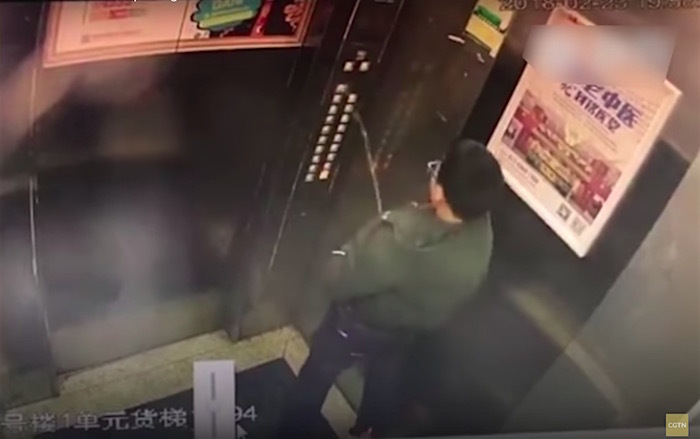 A boy in China thought it was a good idea to hose down the buttons in his elevator by peeing all over them. I have to say, he's got an impressive spray, able to douse the entire panel. But soon after he zipped up and readied himself to disembark the lift, the doors jiggled around but didn't open for him. The buttons started blinking in a glitchy fit, going haywire as the lights went dark. "Lift" is one of the three previously unreleased tracks from Radiohead's 20th anniversary reissue of OK Computer, titled OK Computer OKNOTOK 1997-2017. Video directed by Oscar Hudson. 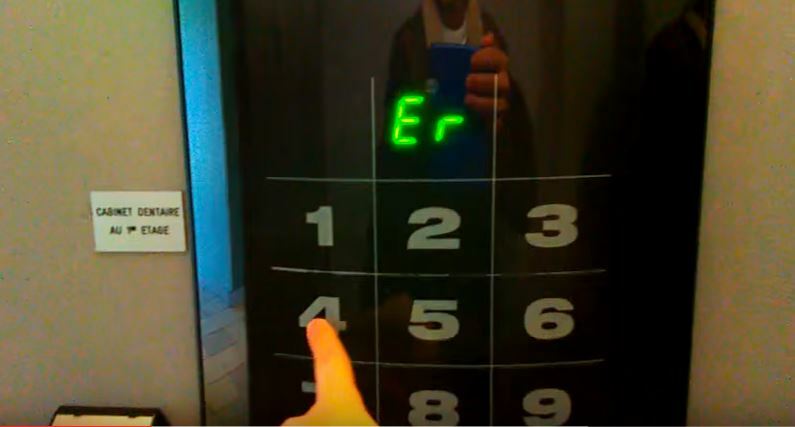 The French Elevator Channel chronicles one man's quest to record illustrative videos of every elevator he has the pleasure to use. Embedded above is the latest at the time of publication, a gated traction elevator at 1715 Av. Santa Fe in Buenos Aires. "These are very nice elevators!" the videographer reports. "Everything is original, except the buttons." Popular classics include a visit to a rare Schindler Smart 002 MRL elevator in Vienna and the unmissable ordeal of the "WORST ELEVATOR EVER" (embedded below) as chanced across in Yerevan, Armenia. Paternoster elevators don't have doors or buttons. The run continuously in a loop, like a ferris wheel. When you reach your desired floor, you get off quickly. 99 Percent Invisible has an article about these curious conveyances, which can still be found in Europe. The compartments of a paternoster lift wrap around like a chain, with two side-by-side openings on each level. Passengers step into and out of either the “up” or “down” side on a given floor. These endlessly looping lifts are slower than conventional elevators, generally moving about one foot per second, which makes it possible to get on and off. Their slow-but-perpetual motion is the key ingredient to their efficiency: with so many compartments and no need to stop, passengers need never wait for a lift. Taken together, all of the small cars can also hold more people than a one-per-shaft system. • High-status individuals are given more space. Making a high-quality elevator isn't just about designing something that can safely go from one floor to another. 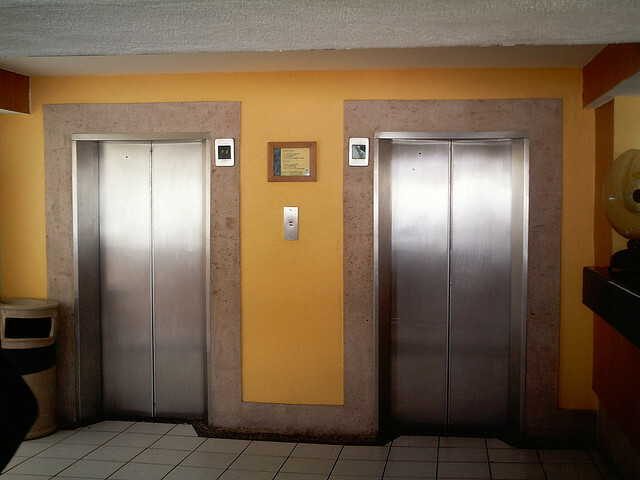 Elevators are service items. That means that when you design an elevator, you also have to design for people — both individual desires and needs, and the desires and needs of a variety of cultures. If engineering is really about designing socio-technical systems, then elevators are big, fat, obvious reminder of that dynamic in play. In a profile written for the Wall Street Journal, author Kate Linebaugh describes the work of Theresa Christy, a mathematician and Otis Elevator research fellow. ... The challenges she deals with depend on the place. At a hotel in the holy city of Mecca in Saudi Arabia, she has to make sure that the elevators can clear a building quickly enough to get most people out five times a day for prayer.